The Best Your business solutions! Lowest Prices and Rate Guaranteed! Everything you need for the 2015 EMV compliance requirements. This unit is unlocked can be used with any processor. Note on PIN pad: The PIN pad we offer are not encrypted and can be used with any processor. APPLE PAY - NFC - EBT - EMV. 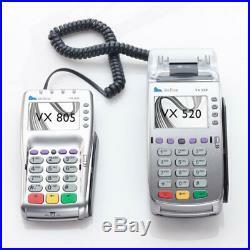 VeriFone VX520 IP/Dial Terminal with VX805 EMV Chip Reader PIN Pad. The VX520 with VX805 PIN pad combo is a great choice for merchants who are looking for a high speed all-in-one countertop terminal. Processor: 400 MHz ARM 11 processor. Display: 128x64 pixel ; supports up to 8 lines x 21 characters. Card Reader: Triple track (tracks 1, 2, 3), high coercivity, bi-directional. Keypad: 3 x 4 numeric keypad, plus screen addressable. Physical: 203 mm L x 87 mm W x 76 mm H; Weight: terminal 500g. Peripheral: Single multi-port connector which supports RS-232, USB device, USB Host, Ethernet. VeriFone Vx805 (M280-703-A3-WWA-3) PIN Pad. Cable for Vx805 PIN Pad. The item "Brand New VeriFone Vx520 and Vx805 + free shipping + UNLOCKED" is in sale since Saturday, January 13, 2018. This item is in the category "Business & Industrial\Retail & Services\Point of Sale & Money Handling\Credit Card Terminals, Readers". The seller is "silverskypos" and is located in Philadelphia, Pennsylvania. This item can be shipped to United States, Canada, United Kingdom, Denmark, Romania, Slovakia, Bulgaria, Czech republic, Finland, Hungary, Latvia, Lithuania, Malta, Estonia, Australia, Greece, Portugal, Cyprus, Slovenia, Japan, China, Sweden, South Korea, Indonesia, Taiwan, South africa, Thailand, Belgium, France, Hong Kong, Ireland, Netherlands, Poland, Spain, Italy, Germany, Austria, Bahamas, Israel, Mexico, New Zealand, Philippines, Singapore, Switzerland, Norway, Saudi arabia, Ukraine, United arab emirates, Qatar, Kuwait, Bahrain, Croatia, Malaysia, Chile, Colombia, Costa rica, Panama, Trinidad and tobago, Guatemala, Honduras, Viet nam, Uruguay, Brazil, Antigua and barbuda, Belize, Grenada, Saint kitts and nevis, Barbados, Bangladesh, Bermuda, Bolivia, Ecuador, Egypt, Guadeloupe, Jordan, Cambodia, Sri lanka, Nicaragua, Oman, Peru, Pakistan.